Archivists are always searching for new and exciting ways to make their content accessible and relevant. Gone are the days when a researcher would expect to go to a reading room, search through a card catalogue, and request to see a record tucked safely in an archival enclosure. Although this is still the case for many collections, digital technology is allowing archivists to bring records to researchers in a virtual space with the only barrier to access being a computer with a suitable internet connection. Researchers have come to expect unmediated access to historical materials and archivists, programmers, and technologists are working hard to provide it. The result of this collaboration is advanced functionality that allows users to zoom, pan, manipulate, annotate, assemble, cite, and share digital images across multiple platforms. The inherent interoperability allows for digital images from diverse collections from potentially incompatible or proprietary systems to be brought together in the same platform. Say you want to compare a digital image from the British Library with one from the Getty Museum, in the same platform, using the same tools. IIIF makes that possible. ALERT – Rabbit hole warning! I promise that if you see this technology in action, you’ll lose at least a few hours. You’ve been warned. The Ransom Center recently launched a new online platform that uses the IIIF to provide enhanced access to over 50,0000 digital images in its online collections portal. 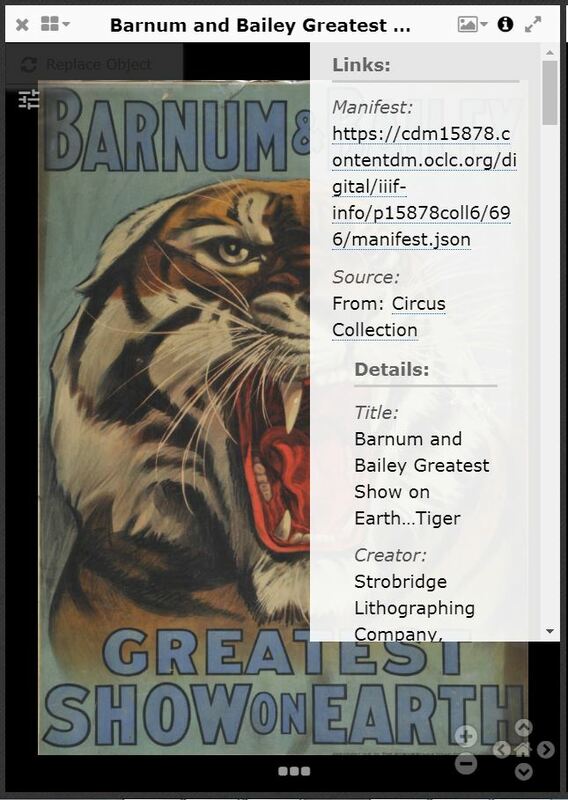 Using Mirador, an open-source web-based image viewing platform, in combination with IIIF, visitors to the Ransom Center’s digital portal can view, compare, and engage with thousands of incredible resources from the Ransom collection and from the many participating repositories worldwide. Users can now choose to browse in the traditional ways of digitized access or they can click the magical IIIF button to explore this new world. 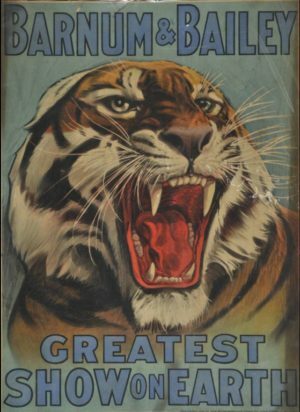 Having watched The Greatest Showman over the holidays, I decided to take a look at the Ransom Center’s Circus collection, which contains clippings, photographs, posters, and programs pertaining to dozens of American and foreign circuses and showmen such as P. T. Barnum, Hagenbeck-Wallace, Ringling Bros. and Barnum & Bailey, Sells-Floto, and Adam Forepaugh. 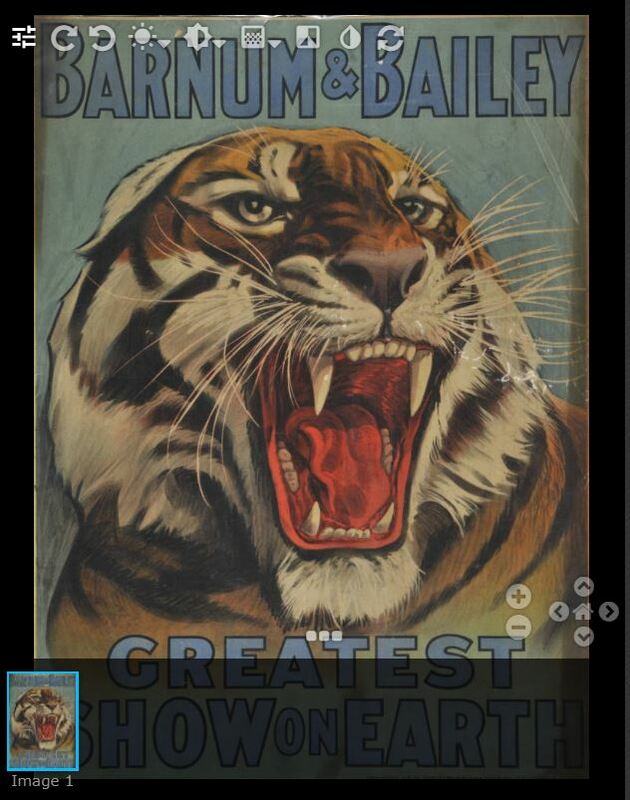 I chose to examine a number of circus posters from Barnum and Bailey, Sells Brothers, and Clyde Beatty Cole Bros. This would be an excellent way of examining the marketing styles of the various circuses. You can easily view metadata, toggle to full screen, adjust the image, zoom, and change the layout to view up to twenty-five images at once. The best part about this new platform is that you can use it with other systems at other institutions. You can add digital objects from other collections from separate geo-remote locations and view them side by side. 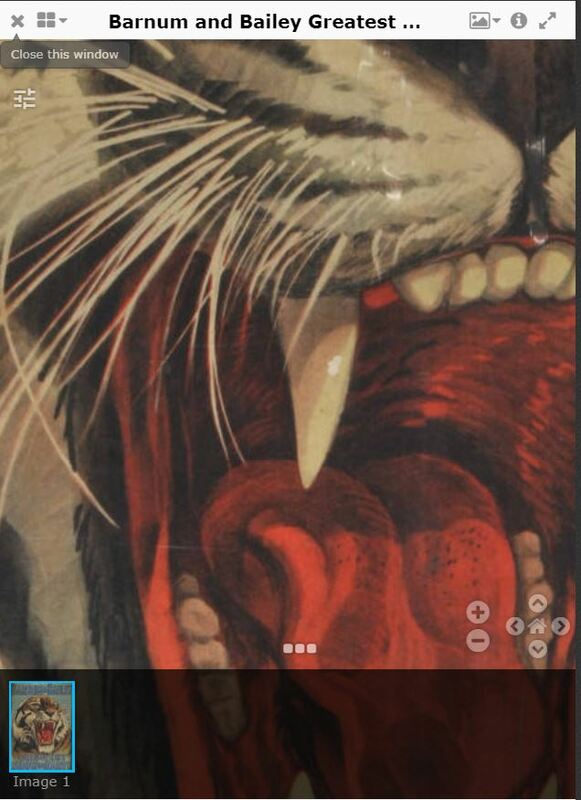 To do this, you simply load the image using its URL into the Mirador viewer. I decided to view the Barnum and Bailey poster from the Ransom Centre alongside Van Gogh’s “Irises” from the J. Paul Getty Museum. Not sure what kind of research question would ever prompt this unlikely pairing, but the technology makes it possible. The University of Virginia Library provides a useful step-by-step introduction to using the technology. This will be helpful for those looking to become familiar with the myriad capabilities of the IIIF, especially when using the Mirador viewer. The Ransom Centre has published 50,000 images using the IIIF. The Getty Museum has over 30,000 images that have received the IIIF treatment. You can also make use of this technology at the Bodleian Library through Digital Bodleian. Mark Matienzo has also provided some links to other participating institutions. One of the most impressive uses of this technology is from the Internet Archive, which has made 9.3 million books and images available through the IIIF. You can read more about the project here. The blog post suggests that you could compare a Plato manuscript held by the Internet Archive to one held by Oxford. This technology makes for infinite research possibilities.